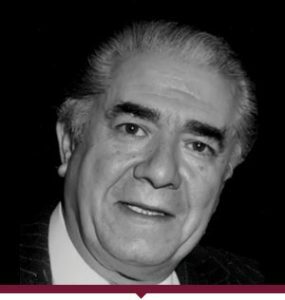 Known as the “Golden voice”, the true successor of Beniamino Gigli, and for his long-term performance and recording association with the soprano Maria Callas, Giuseppe di Stefano was born in Motta Sant’Anastasia, a village near Catania, Sicily. He was the only son of a carabiniere turned cobbler and his dressmaker wife. Di Stefano was educated at a Jesuit seminary and briefly contemplated entering the priesthood. After serving in the Italian military (and briefly taking lessons from the Swiss tenor Hugues Cuénod), di Stefano made his operatic debut in 1946 in Reggio Emilia as Des Grieux in Massenet’s Manon, the role in which he made his La Scala debut the following year. The great beauty of his lyric tenor voice quickly won him international attention and he was duly engaged by the Metropolitan Opera in New York. He made his New York debut in 1948 as the Duke of Mantua in Verdi’s Rigoletto. He went on to perform regularly in New York for many years. In 1957, di Stefano made his British debut at the Edinburgh Festival as Nemorino in L’Elisir d’Amore and his Royal Opera House, Covent Garden debut in 1961 as Cavaradossi in Tosca. As a singer di Stefano was admired for his excellent diction, unique timbre, passionate delivery and, in particular, for the sweetness of his soft singing. In his memorable Metropolitan Opera radio broadcast debut in Faust, he attacked the high C forte and then softened to a pianissimo. Sir Rudolf Bing said in his memoirs that this was the most beautiful sound he had heard come out of a human throat during his many years as general manager of the Metropolitan Opera. During his years of international celebrity di Stefano won a gold Orfeo, an Italian musical award similar to the American Academy of Motion Picture Arts and Sciences’ famous “Oscar”. In 1953 Walter Legge, leader of HMV (EMI)s classical wing, wanted a tenor to record all the popular Italian operas with Maria Callas and chose Giuseppe di Stefano. They did not sing together on stage often, but the live recording of “Un Ballo in Maschera” from La Scala gives a fine impression of his art and dramatic impact on stage. He also sang Alfredo with Callas in the famous Visconti production of “La Traviata” in 1955 at La Scala, of which a live recording exists on CD. In 1973 di Stefano accompanied Callas on her final recital tour that ended in 1974. His final operatic role was as the aged Emperor in Turandot in July 1992. Tenor Luciano Pavarotti said he modelled himself after di Stefano, a fact that gained much attention after Pavarotti’s death in September 2007. Di Stefano is also known to be the tenor who most inspired José Carreras.